As part of its Prosperous Communities Initiative, Public Land Solutions has begun a survey of communities around the nation that are utilizing the currency of the 21st century, recreation assets, to attract businesses and residents. These places are the backbone of the tourism and recreation industries, which produce over $887 billion annually across the country. According to the 2017 Deloitte Millennial Survey, work/life balance ranks as more important than career progression for the majority of millennials. Many states spend millions attracting visitors and new residents to their states, and a corresponding investment in the recreation assets in these areas can increase visitors, attract new residents, and help employers recruit and retain employees. There are many examples of places around the country that have invested in recreation and public land as an economic driver. Below are several examples of communities that have experienced economic growth because of their public lands. Twin Falls, Idaho. Clif Bar specifically located here based on the access to public lands and the quality of life offered to their employees. In 2013, Chobani yogurt also choose to build a factory in Twin Falls, and announced a $100 million expansion of the plant in 2016. Late last year, the company began building a 70,000-square-foot research and development and community center, the design of which is “inspired by the nature of the Magic Valley.” Outdoor recreation activities in the area include hiking, ziplining, canoeing and kayaking, skiing and snowboarding, and mountain biking. 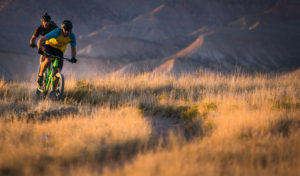 Mountain bikers outside Fruita, CO. Used with permission. Fruita, Colorado. The town of Fruita built 150 miles of mountain bike singletrack, which spurred the economic revival of thetown and turned it into a desired mountain bike destination and helped it to become “synonymous with trails.” In its 2011 EconomicDevelopment Plan, enhancing recreational assets is listed as a top objective and the town’s status as an international mountain bike destination is identified as one of the area’s top assets. Bentonville, Arkansas. In the early to mid 2000s, Walmart began investing in trail systems in and around Bentonville in an effort to recruit and retain employees to its corporate office there. The town has now become a mecca for mountain bikers and hikers. In addition to its many miles of trails, Bentonville hosted the International Mountain Bicycling Association (IMBA) World Summit in November 2016, and just prior opened the country’s first mountain bike playground for kids. Leavenworth, Washington. The town of Leavenworth began its transition to a tourism and recreation based economy in the 1960s, after the railroad abandoned the town and the timber industry in the area began to fail, and now hosts more than 2 million visitors a year. Called “Washington’s Playground,” Leavenworth offers extensive outdoor recreation opportunities, from whitewater rafting to birding, hiking, snow sports, rock climbing, and more. Bozeman, MT. Bozeman is one of the fastest-growing cities in Montana, thanks to its robust recreation economy and access to pristine public lands. The city has become a technology hub, with the quality of life attached to outdoor recreation cited by businesses as a reason to locate in the area. Bozeman marketing consulting firm Elixiter even boats a 75% employee retention rate, with work-life balance being the primary factor. As part of this project, PLS is also bringing elected officials from these communities to Washington, DC to meet with agency officials and members of Congress to discuss how outdoor recreation has economically benefitted their communities. The trip, planned for late April, will give local elected officials the opportunity to showcase how important the recreation economy is to communities around the nation. 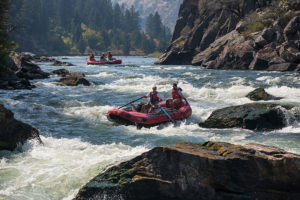 PLS is continuing to survey and report on the recreation economy around the U.S.; keep an eye on publiclandsolutions.org for more updates on this project.